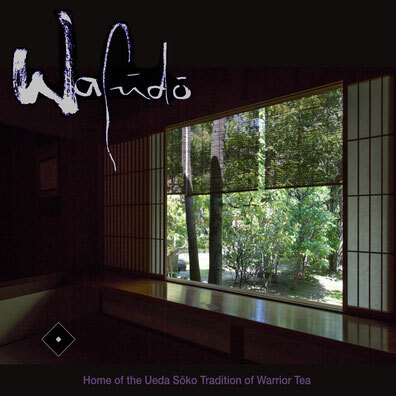 Wafūdō 和風堂 is the home (Iemoto) of the Ueda Sōko Ryū in Hiorshima, Japan. The first Wafūdō tea villa was built by Ueda Sōko in Wakayama. After relocating to Hiroshima in service of the Asano Clan, Ueda Sōko built his second Wafūdō tea pavilion complex on the grounds of Hiroshima Castle. Wafūdō was in active use on the Hiroshima Castle precinct until the Meiji Restoration of 1872. With the Meiji Restoration, the Ueda family were forced to leave Hiroshima Castle and construct a third Wafūdō at its current location in western part of Hiroshima city. This seeming misfortune turned into fortune with the Atomic Bombing of 6th August, 1945. The central city area of Hiroshima was erased by the atomic bomb. The original Wafūdō and main residence of the Ueda family in Hiroshima was located near the epicentre of the blast and were reduced to ash. Some years prior to the bomb, heritage tea utensils, artworks and historical documents of the Ueda family were moved to the residence in the western district of Hiroshima city. It is thanks to this that the restoration of the original residence was possible, based on the original plans used in the creation of the Wafūdō that existed on the grounds of Hiroshima Castle. This pamphlet describes the history of Wafūdō, its tea rooms and gardens, and the restoration process.